The next morning, Wednesday, July 26th, 1978, my 50th birthday, Keith Kaul drove me to the Dhahran Airport on the new divided highway that had just opened recently. The sand dunes along the way all looked so undisturbed and pretty. I tried to relish as much of the old, familiar desert look of Arabia as I could as we drove along, with my eyes and my camera. The Airport itself was a mass of confusion with tons of waiting passengers, mostly from the Far East, sitting or laying around in groups all over the floor with their luggage. We worked our way to the check-in counter with my luggage and crated painting and finally got squared away. I thanked and said goodbye to Keith, then went on into the waiting area for take-offs. It wasn't long before we boarded the British Airways Tri-Star jet and taxied past all the terminal buildings and some small Saudi fighter jets, waiting to practice take-offs and landings. Then we took off ourselves, for what I thought would be the last time from Saudi Arabia. I thought my life was over. I had decided to keep the same schedule Oran and I had made originally and stay a few days in London before flying on to Dallas. The weather should be more pleasant than the last time we were there and the guys at work had told me about so many interesting sounding places to see. That turned out to be a mistake, but the "fat was already in the fire". The Freddy Laker Economy Flights out of London had just gone into effect, and I had never seen such a mass of people in any airport at one time before or since, even in Arabia. After landing at Heathrow, it took me over two hours standing in the "queue" before I could get my passport checked and released into the luggage area. Another very unpleasant surprise waited for me there. Someone had put a slated crate of ripe dates on the plane with the luggage in Arabia, and it had broken open. Dates were smashed and smeared all over everything. One of my bags was particularly involved, so a porter helped me clean it up as best we could before I caught a taxi to my hotel. I ended up tossing that bag when I got home, as it was impossible to clean. The hotel was a small, older, out-of-the-way place that Oran had stayed in on his way back to Arabia after vacation. It was not one I would have selected, and my room was down a long, dark hall, in the back, with a window facing the garbage cans in an alley. I'm sure it was the one reserved for old American women traveling alone. For the few days I was there, I took a boat tour on the Thames River, saw the London Tower, spent some time in the pub next door to the hotel, and jumped at the chance to have dinner with one of our American friends from Ras Tanura who had been on the same flight with me from Arabia. I found out it was not any fun at all to travel alone, even in interesting places of the world. My departure from Gatwick Airport was again proceeded by wading through throngs of people sitting and laying around all over the airport floors, waiting to fly out of England. Some of them had been hanging around the airports for days, as there was a strike of some kind going on as well as the new Freddy Laker flights. The only planes that were taking off at all were to the United States, so I got lucky there. I had been sad to leave Arabia, but when my 9 hour, non-stop flight from England was over, Dallas didn't look so bad after all. 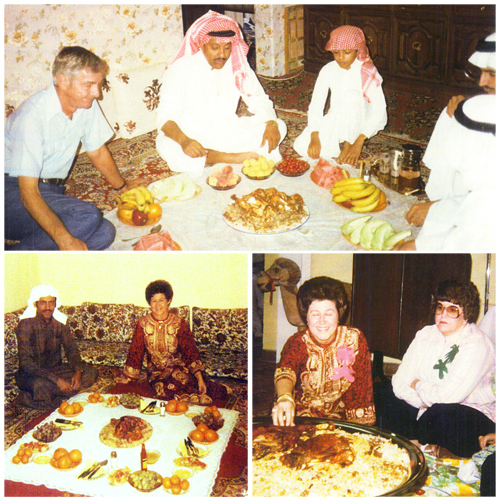 Oran at Wahab’s house with his son, brother, and father; Colleen at a lunch at Brahaim Bosbate’s home; and a Women’s Club function in Udhailiyah. 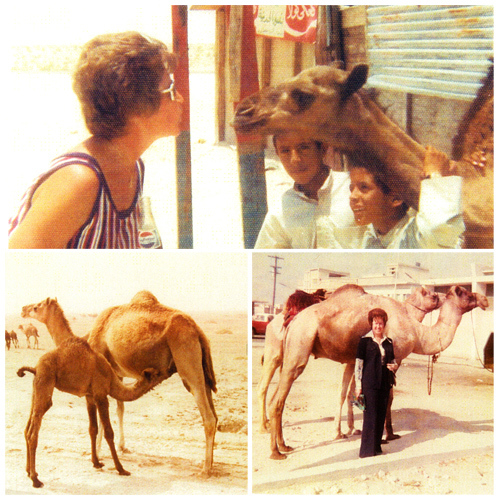 Colleen with a baby camel at a Pepsi stand, and full-grown camels. 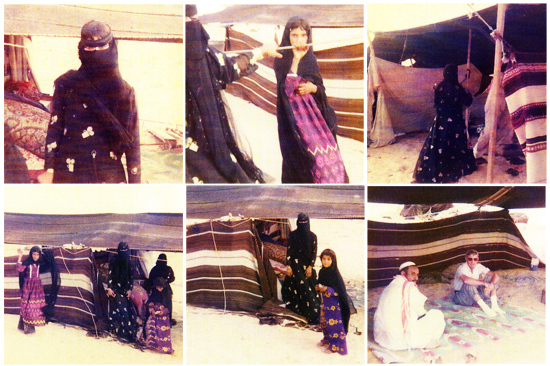 Visit to a Bedouin tent south of Udhailiyah.